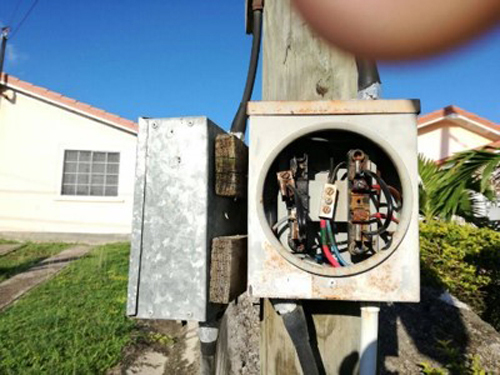 Several communities in St. James are among those frequently impacted by incidents of theft and vandalism of Flow Jamaica’s network infrastructure and elements. The vandalism of primarily fibre cables in Western Jamaica has resulted in frequent disruption in video, internet and voice services to hundreds of customers. The affected communities include Tucker, Irwin, Fairfield, Meadows of Irwin, Porto Bello, Dollar View and John’s Hall. Since January 2018, Flow says it has spent in excess of J$4 million to replace and restore its network infrastructure in Western Jamaica. “Each time we have these incidents, hundreds of customers are left without service. When one considers how integral access to telecommunication services is to our daily lives and businesses, the impact is immeasurable as communities are at risk with compromised access to emergency services. Businesses, schools and students are without services and even the providers of the emergency services are impacted as they are unable to function efficiently and effectively,” said Kayon Mitchell, Director of Corporate Communications and Stakeholder Management at Flow. “We have put several measures in place to protect our network and curtail these incidents but this scourge requires the support of the residents and the wider community,” she added. Flow currently spends around US$2 million annually for replacement and restoration costs in communities impacted by theft and vandalism across the island. The major hotspots are located in St. James, St. Catherine, Kingston, St. Andrew, St. Thomas, St. Mary, Portland, St. Ann, Hanover, Trelawny, Manchester and St. Elizabeth. Flow is encouraging residents to call CRIME Stop at 311 if they notice any suspicious activity near Flow’s equipment or infrastructure. A reward is offered for each arrest and up to J$1 million for every conviction. All calls are confidential.